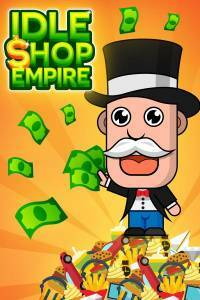 Idle Shop Empire is a free-to-play idle clicker game where your objective is to build the biggest, most luxurious and profitable shopping malls around the world by making money from the different products you sell. The game involves leveling up your cashiers and upgrading your stocks to unlock new products to make visitors spend lots of money. You will also have to hire technicians to deal with power failures, security against shop lifters and cleaners to keep your mall clean and tidy. As you build new floors you will discover powerful boosters and expensive products that will help make you become incredibly rich. You can manage up to three malls which you are able to build up to 20 floors and each floor will sell a unique product. The first mall you get free and the first product you sell to get the money making process started is French fries. The products are supplied to each floor through the elevator by the courier boy who picks them up from the truck parked outside your mall. Your progress rate will be slow if you only focus on the low-rank floors such as French fries, hamburger, and lemonade. It is advised that as soon as you have saved up enough Mega Coins you use them to build new so you can sell more profitable items. Make sure you upgrade your best money making product whenever you can so you increase its selling price and earn more money from it. Whenever a product reaches a milestone level such as 50, 100, 200 etc. the quality of the product will increase and also its price which will enable you to make even more money from it. You can earn free Mega Coins by watching the video advertisements whenever they are available. You will find this option at the 'Shop' tab above the coins pack section. Use the Mega Coins you earn to buy floors. If you find that the floor's cost is too expensive then you have the choice of either saving your Mega Coins for later when you have the needed amount or alternately spending them on activating boosters such as Elevator Madness and Cash Joker. Check out our Questions & Answers page if there is something you are unsure of. 8Is the end actually coming this time? 1742What Game Are You Currently Playing?